This is an OLD recipe, one my family has been since before I was born, a gem from a cookbook from yesteryear. 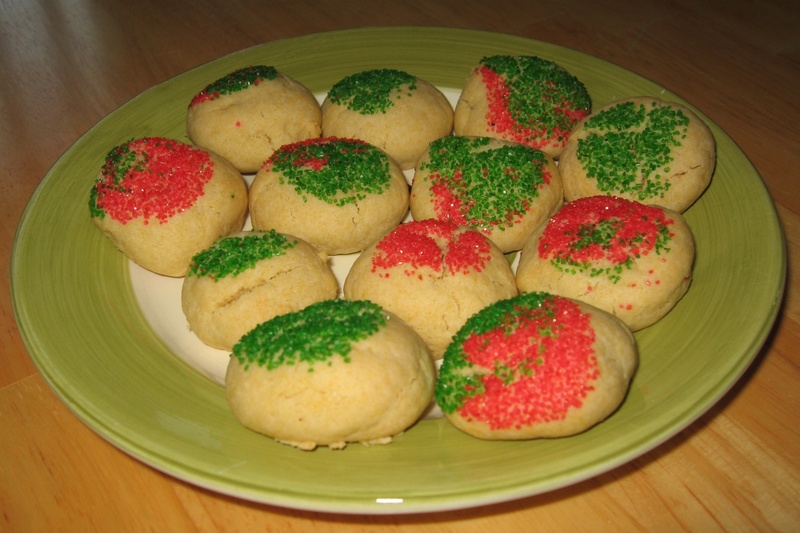 Understand that this is a cookie that tastes better a day after you make it. When you pop one in your mouth fresh out of the oven, you’ll probably think it’s not without its charm, but nothing particularly special. The next day you’ll try one and curse yourself for not making a double batch. For best results, use an AirBake cookie sheet (it does make a difference). Preheat oven to 350 degrees F and line baking sheets with parchment paper. In the bowl of a stand mixer, cream together butter, sugar, egg, and honey. Add vanilla and mix. Add sifted flour, soda and salt; mix well. Cover bowl with plastic wrap and chill at least an hour (or the dough will be sticky and difficult to work with). Roll dough into 1-inch balls, then roll in colored sugar. Bake 10 to 12 minutes.